The author of The Fault in Our Stars is back with arguably his most personal book yet, a story of love, friendship and mental illness. Sixteen year old Aza sets out with her best friend to find a missing billionaire and claim a reward, whilst in thrall to the spiral of her own thoughts. Star Wars fan fiction features too. Which self-respecting teen wouldn’t appreciate finding this in their Christmas haul? 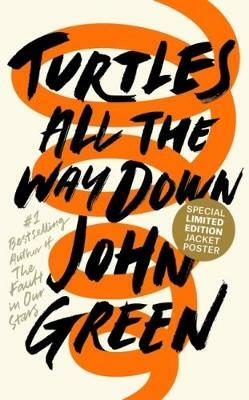 Turtles All the Way Down is the story of sixteen-year-old Aza Holmes, a young woman looking for clues in the disappearance of a fugitive billionaire, while grappling with mental illness. “The way he talked about thoughts was the way I experienced them – not as a choice but a destiny. Not a catalogue of my consciousness, but a refutation of it.” When you flip open a new book by an author you’ve read multiple books from before, it’s only natural to compare the books and figure out where this new one stands on your list. Which I think was a mistake because Turtles All The Way Down is unlike anything I’ve ever read before and when you do read it, you’ll fully understand what I’m talking about. Turtles All The Way Down was ABSOLUTELY EXCEPTIONAL and INTENSE and reading it was a journey that everyone should take. Turtles All The Way Down was a harrowing depiction of life from a teenager who suffers from mental illness and it was astoundingly well done MY THOUGHTS: 1. I have missed John Green’s writing. Nobody else writes like him, with shrewd observations, quirk, sass and dialogue that will make you think. It’s been forever since I experienced his writing, but waiting all these years for Turtles All The Way Down was worth it. I’ve never seen mental illness represented better. 2. AZA WAS A BRILLIANT CHARACTER. I LOVE her name and the story behind it but I loved the girl the name belonged to too. I realised mid-way through the book that even though the whole thing was told from her own point of view, she barely spoke at all. This book is told mostly through her thoughts and her illness. She was extremely intelligent and flawed and me describing her doesn’t do justice to her character at all. 3. The OCD/ Anxiety rep is INTENSE. And it felt so real and palpable to me. There was this one particular scene where Aza’s ‘rational’ brain and her illness are battling it out against each other and I had to put the book down after because John Green and Aza make you FEEL and I needed a breather. 4. I think one of my big problems and the reason that this book wasn’t a five star for me is the pretentiousness of the characters, specifically the best friend Daisy. I’m ALL for pretentious characters but why does EACH AND EVERY CHARACTER HAVE TO BE PRETENTIONS/ MANIC PIXIE DREAM-Y? Daisy was… obnoxious. AND RUDE AND HORRIBLE and she *SPOILER* [ wrote fanfic about her best friend who had a debilitating mental illness by calling her ‘useless’ and an idiot and it HURT ME PHYSICALLY THAT SHE COULD DO SOMETHING LIKE THAT. HOW.] I wanted to strangle her because she was NOT A GOOD FRIEND AT ALL. STOP. 5. I’m not 100% sure how I felt about the romance between Davis and Aza. I LOVED them as individual characters and I loved their interactions but it was a little too flawless for two teenagers. I loved them and I also… didn’t? I’m a confusing person, I know. All in all, this book is real and brilliant and intense and it talks about who we are, who are thoughts belong to and it will make you FEEL. This book makes you understand mental illness in such an intimate and personal manner and I have, once again, been left in awe of John Green’s masterful writing. 4 stars.